The 10 Best Pho Restaurants in Arkansas! Satisfying both vegetarians and meat-lovers alike, pho is an excellent option for lunch and dinner. This soup, traditionally made with broth, rice noodles, and herbs, is served up deliciously all across Arkansas. 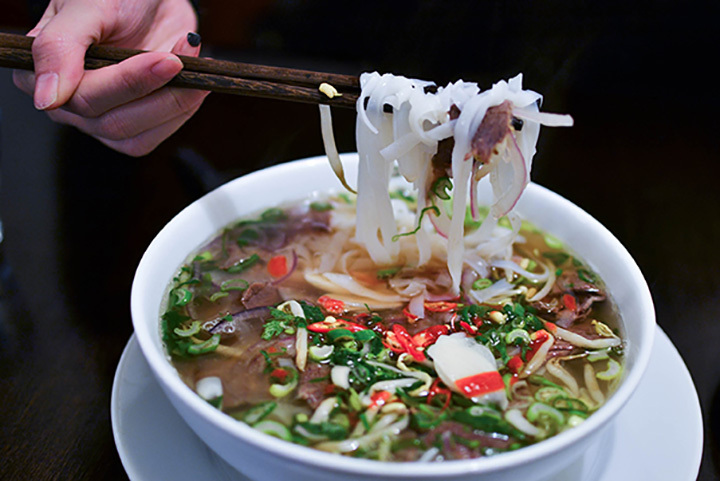 Here are the 10 best restaurants for pho in the state. You’ll find this pho favorite on East Grand Avenue in Hot Springs. Pho Hoang My is known for its huge portions and has gained recognition for being one of the best Vietnamese restaurants in the Hot Springs area. With menu items that range from bubble tea and Com Chay to Pho Bo Vien and Pho Tai, Pho Hoang My has something for both vegetarians and meat-eaters. Located on North Shackleford Road in Little Rock, Pho Thanh My serves up delicious Vietnamese cuisine during the lunch and dinner hours. This spot is known for its crater-sized serving bowls and, of course, for that famous Vietnamese noodle soup. This family-owned Russellville restaurant uses authentic recipes straight from Vietnam to create its well-known cuisine. Linh’s is popular for serving traditional Pho and handmade Vietnamese eggrolls. If you’re looking for authentic pho in a small town, then look no further than pho and More in Jacksonville. This spot is well-known for its large portions, quiet atmosphere, and friendly staff. In addition to the pho, locals also love the fresh Vietnamese-style sandwiches as well as many other menu items. This small family-owned business focuses on dishes that are influenced by authentic Vietnamese and Chinese flavors. While the pho served here may be one of the most popular dishes at Orient Express 2, the menu choices range from Vietnamese ice coffee and eggrolls to Mem Ga and Bun Bo Xao Xa. Pho Vietnam is one of the most popular Vietnamese restaurants in the River Valley area. A Fort Smith favorite, this place is well-known not only for its authentic pho dishes but also for many other Vietnamese specialties like Bun Bo Xao and Banh Xeo. Locally owned and operated, this popular Little Rock spot known for its authentic Vietnamese and Chinese food. The locals give the pho at Mike’s Café rave reviews as well as giving this place two thumbs up for its great customer service. Offering dining, delivery, and take-out, Smile Bull is a cornerstone of the Fort Smith community. Among the many delicious menu options, the locals love the popular Vietnamese Rice Noodle Bowl as well as the pho, which is made with beef eye round steak and meatballs. This contemporary spot is located on West Walnut Street in Rogers. Saiwok is well-known for its pho (of course!) as well as its lively atmosphere. Other popular menu items include Banh Mi and Imperial Vietnamese Coffee Stout. The Green Papaya is one of Fort Smith’s favorite Vietnamese restaurants. Ask the locals and they’ll tell you how much they love the egg rolls and the pho! From the fresh food to the friendly service, you won’t be disappointed with this spot.